The hardscape and tightly clipped boxwood edging make a big impact at the Heronswood garden in Kingston, regardless of the season. Every once in a while, a garden captures our hearts. Visitors want to linger, spirits are lifted, imaginations awaken. The smallest of gardens can make an enormous impact. What is that extra ingredient that transforms an ordinary landscape into an extraordinary one? Gardens are very personal spaces, and when created to reflect and concentrate the deep-felt moments of the gardeners’ lives, they have the power to continue to enrich them, a power to transport them to a different time and place. Are there some flowers, shrubs, trees that evoke a favorite memory? 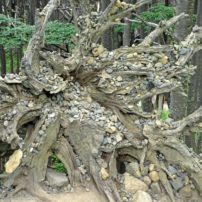 A trip to southern Chile, where wild fuchsias and Chilean fire trees decorate the trails, drawing in raucous hummingbirds? A huge maple tree around which childhood friendships blossomed? A rose that always made grandma smile? A long grape arbor covered with the sweetest grapes to run through as a child? This small garden centers around a colorful eating area size does not matter, the garden is full of surprises. Garden of Ted Hoppin, Bainbridge Island. These special moments are a great start to defining the theme of a garden. A theme helps to lend cohesion and focus in the design, and is a good place to start the planning. Peter Rabbit, where did you leave your waistcoat? Garden of Lynn McIntyre, Bainbridge Island. Sanctuary: Will the garden be a wildlife sanctuary in an urban jungle? 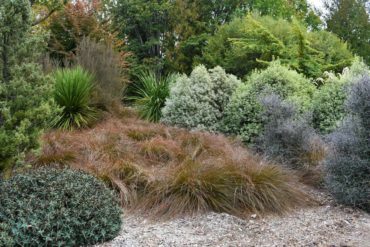 The garden will be created around a variety of plants that offer food to the local fauna, including many native species, as these are best for feeding native creatures. A water feature can become the focal point, not only inviting birds to bathe and amphibians to live, but also offering the soothing sound of water to the gardeners and a place to enjoy a quiet moment on a hidden bench. 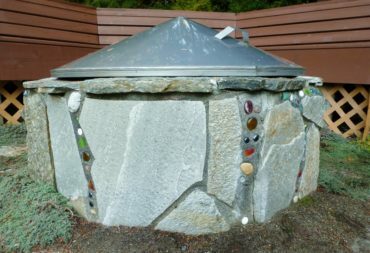 Designing the water feature with specific animals in mind, it can have very shallow (1/4-inch) pools of moving water for the tiniest of birds like hummingbirds, deeper areas for fish to hide from raccoons, and intermediate depths for holding water plants for fish and amphibians. A beautiful setting, reminiscent of a waterfall that always looks great. Bainbridge in Bloom, 2014. Gathering place: Will the garden serve as a gathering place for social events? 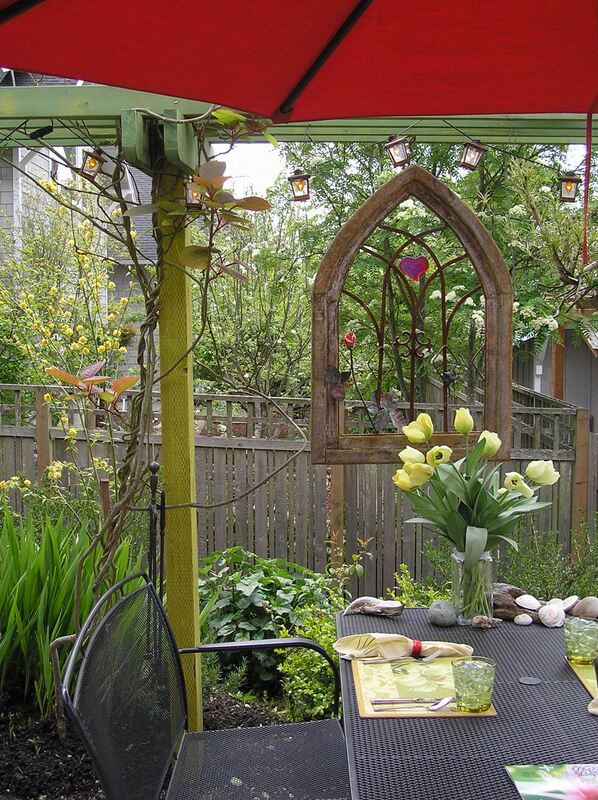 It could become an outdoor kitchen/dining area, protected from the elements with a partial roof over a patio. Or a private, enclosed space with enough seating to accommodate the guests. Strings of sparkling lights could hang from trees and indirect lighting could transform a nice tree into an illuminated sculpture once the sun sets. And don’t forget to add an awesome fire pit. Edibles: Another theme could be the edible landscape. A kitchen garden so beautiful, it will never be a chore to spend the time necessary to keep the larder full. Trees, shrubs and vines chosen for their ability to feed not only their caretakers, but be offered at perhaps a farmers market stall or to the neighborhood food bank. A great way to transform a food garden into a beautiful space is through an attractive hardscape, like well-designed raised beds, a beautiful deer fence that suits the style of the home, pathways made of timeless materials like bricks or stone, and colorful bird houses inviting birds to raise their hungry offspring and help with pest control. A whimsical greenhouse elevates the kitchen garden. Bainbridge in Bloom, 2007. Park: A garden could also be a sculpture “park.” How wonderful to be surprised by a whimsical sculpture in unexpected places! Even flags fluttering in the breeze or wind chimes hidden next to a bench can serve this purpose. 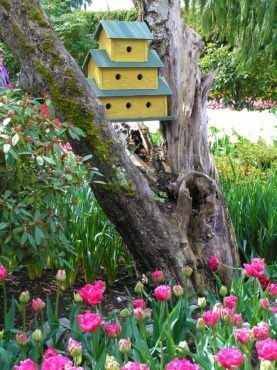 A beautiful, old tree trunk or tree root could be transformed into something even more special with a little imagination. Portal: The garden could be a portal to a place far away: an alpine meadow, a beach or a cottage garden in the Lake District. 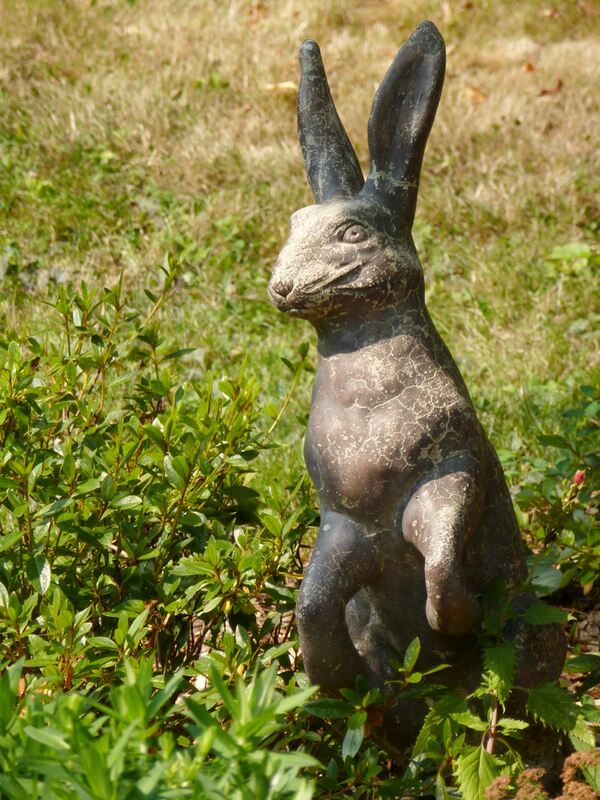 Is that Peter Rabbit eating the carrots in the garden? 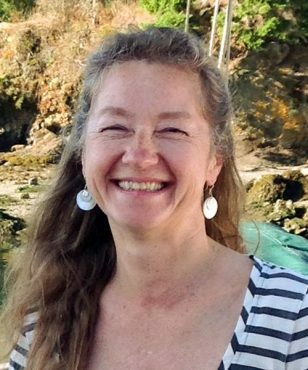 Mediation: A relaxing, contemplative theme would be a space where the visitor feels free to think, be soothed, to meditate and to heal. 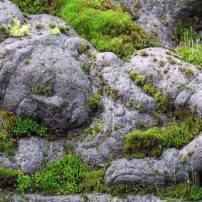 Mossy logs surrounded by lush ferns, a stone sculpture blending into the soil, river stone mosaic, a place to settle in and be. 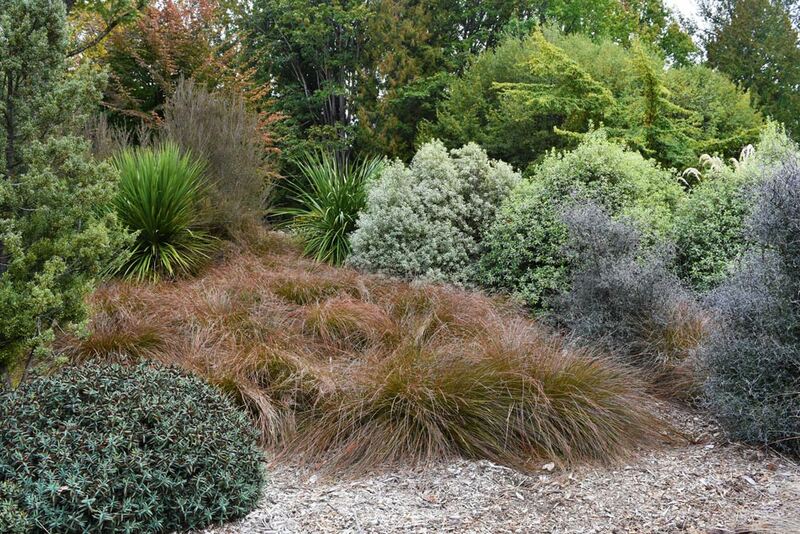 A New Zealand xeriscape theme is taken to a whole new level at the Seattle Arboretum. Be creative, take some time to discover what that special place surrounding your home can become, and have fun. 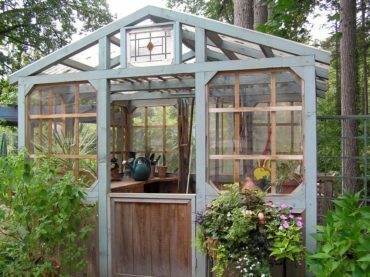 Having strong structure in a garden almost guarantees the space will make an impression no matter the season or the possibly unruly plants exploding in the beds. These elements will be the permanent anchors throughout the year. They will organize the areas and relieve the chaos. They will be the outdoor floors, the walls and even the ceilings that will create the feel of outdoor rooms. When considering the materials, take into account the style and color of the home and extend them into the garden to tie the two together. The shape of an entryway or the windows as well as the colors can translate into the archways of a pergola, the style of the pavers and the color palette of the plantings. 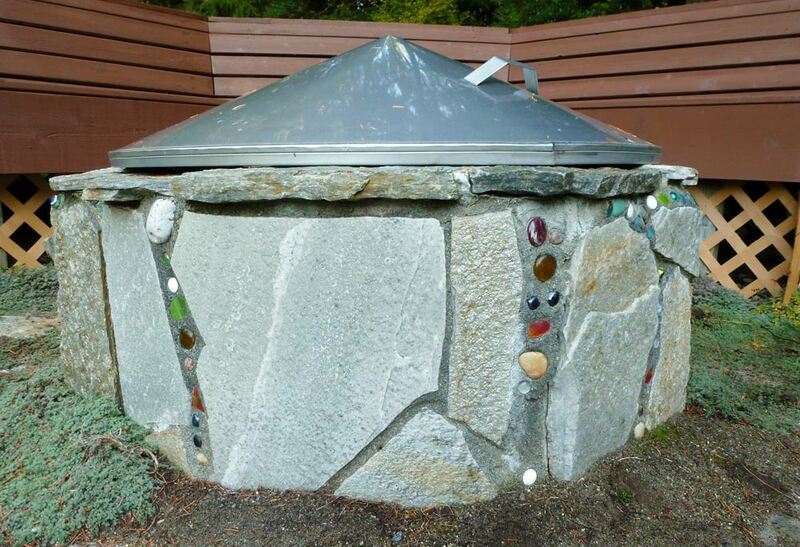 Colleen Miko’s fire pit is no ordinary circle of rocks. A little creativity can transform the mundane into a star. 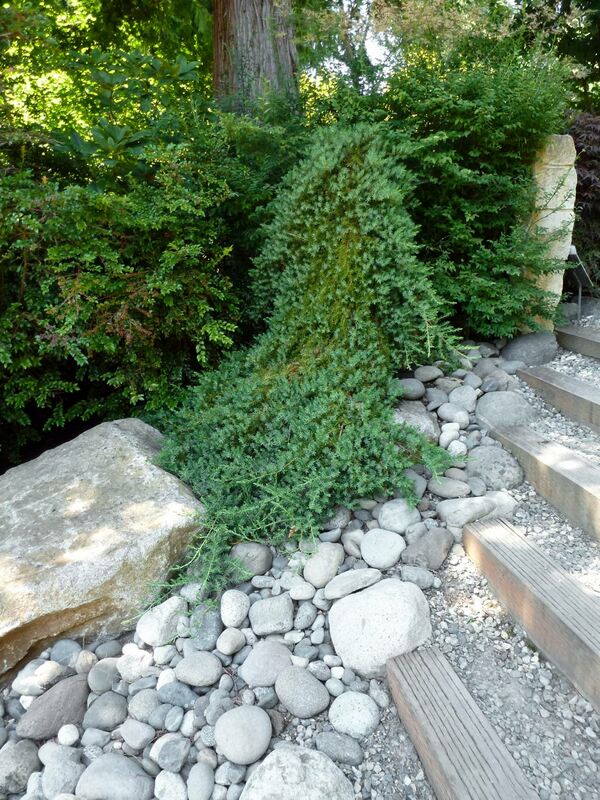 Plants can also contribute structure almost as a hardscape does. Since they generally function as walls, whether small or large, the most-effective plants used for this purpose are evergreen shrubs and trees, and are most often solid green to provide a good contrast to the more frivolous, colorful stars of the garden. Careful selection is important to keep maintenance to a minimum. Slow growers make sense unless you enjoy regular workouts with the hedge shears. 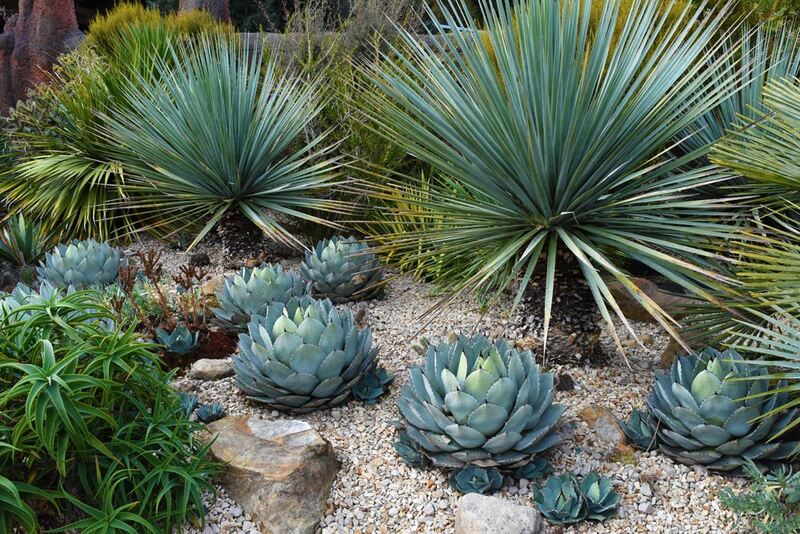 One of the more difficult aspects of gardening for true plant lovers is restraint. Our brains can be overloaded quickly if our environment is chaotic. 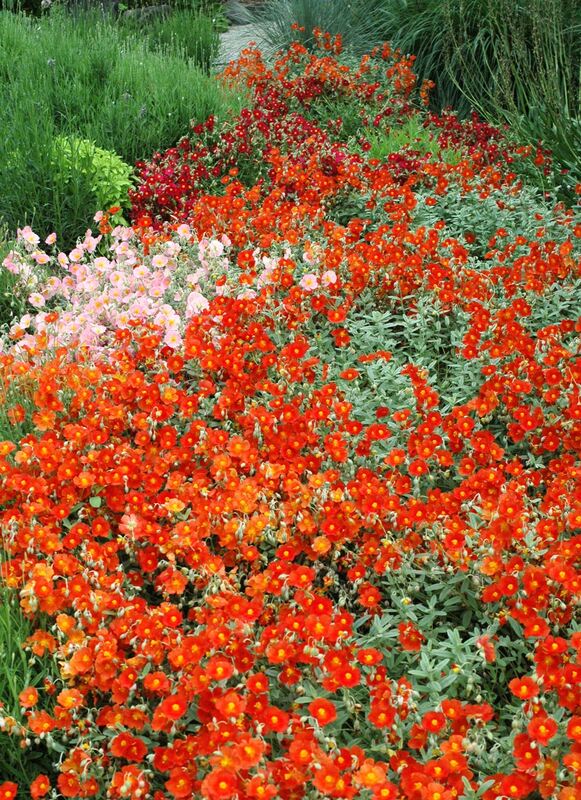 A successful approach is “restraint in favor of unity.” Exuberant gardens are amazing spaces to behold if unity has been achieved either with the structure of the garden or by the repetition of various elements such as color combinations. Nurseries are wonderful for getting inspired and learning to notice details like effective color and form combinations. 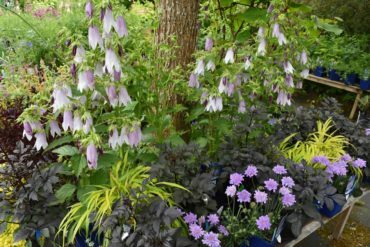 Cultus Bay nursery, Whidbey Island. 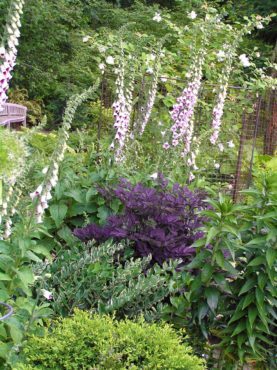 Unity can be achieved by creating an effective vignette of plants that are pleasing in their form, texture and color and repeating that combination in other areas of the garden either exactly or by echoing the main ideas. Having decided on a theme is helpful in staying true to an idea and will aid in exercising restraint. Subdividing the garden into separate areas allows for a variety of garden ideas to be developed without muddying each picture. You don’t have to give up your creativity, just organize your wonderful ideas into garden rooms. Unity will also be achieved by the appropriate use of hardscape elements that suit the home and the plantings. Mixing too many material styles and colors will read as clutter, just as it does inside a home. 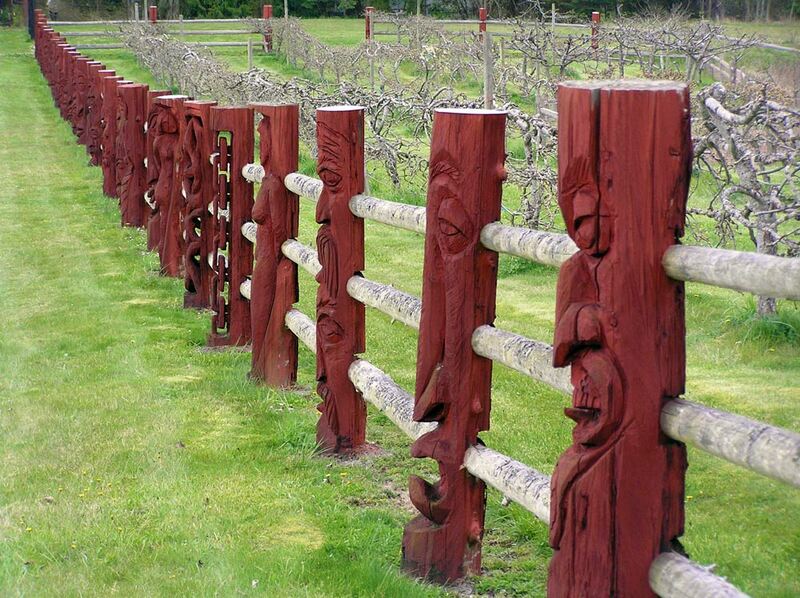 What a delight to come across an orchard fence like this while exploring our backcountry roads! Mystery and surprise go hand in hand. A winding path that may hold a secret is tantalizing. What could that secret be? Imagine walking through tall grasses waving in the breeze and coming to a clearing with a gorgeous red maple tree, back-lit by the afternoon sun. Or, walking down some stone steps among a bank of blooming hydrangeas and coming upon a lovely stone fountain and an inviting hammock. Or, a sculpture that moves in the wind, sitting at the end of a path. Or, a human-sized chessboard hidden in a glade, ready for a match. 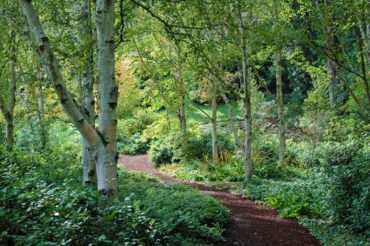 Bloedel Reserve delivers a serene scene with its Himalayan birch-lined path and a simple white/green color palette. A focal point — a special feature — draws visitors deeper into the garden. A garden that offers such surprises is a gift. We inherently understand when something is in balance. The proportions feel right; the effect is satisfying. Some of the best designs are achieved in nature without our interference. Tall trees are anchored by smaller, understory trees and even smaller shrubs, all the way down to the smallest ephemerals on the forest floor. An excellent example of staying true to the theme through restraint, repetition, and unity of plant material and hardscape. Point Defiance Zoo. As elevation is gained, the trees get naturally smaller, fighting with the harsher elements, and all the other plants are reduced in size proportionately. At the highest elevations, trees are no longer present, and the low-growing heathers provide the height in the alpine ecosystem, anchored by even lower alpine plants holding on to the rocky slopes. Perfectly balanced natural gardens. The Pacific Northwest backdrop is usually composed of giants among trees. A garden usually calls for smaller understory trees to tie the strong vertical element to the ground below. The absence of this middle layer would feel very much out of balance. Colorful birdhouses will delight anyone, including the birds, bumblebees and spiders. Nature also demonstrates beautiful balance in its use of the Fibonacci spiral, from the spiral found in shells, to the seeds packed into a sunflower, to the petals of a rose bud. The golden ratio and the golden spiral can be very useful in designing the shapes of hardscapes and softscapes that are beautifully balanced. 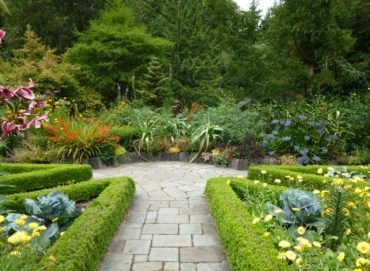 Public gardens like the Bellevue Botanic Garden showcase the power of thoughtful plant partnerships. Finally, the specific plants enter the decision-making process. Some will serve as the accompaniment, while a few will get to be the exclamation points. Their contrast allows for the eye to appreciate the stars as they stand out from among the background plants. A yucca nestled in a field of soft grasses, a Phormium amid a sea of succulents, a soft dwarf Chamaecyparis surrounded by black mondo grass. 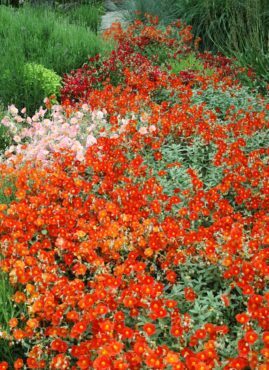 An exciting, hot-colored scene at the Albers Vista garden on a well-drained slope shows restraint through the planting of large drifts of a single species. Foliage color echoed in the colors of neighboring plants creates a melodious composition, setting the stage for the diva of the plant world, the accent of contrasting splash of color against its companions and the painted surfaces nearby. Orange against dark blue, red against black, yellow and purple — all create contrast and serve to wake us up. Calmer color schemes serve contemplative settings. White and blue, dark green and chartreuse, lavender and pale gold tend to calm a planting. 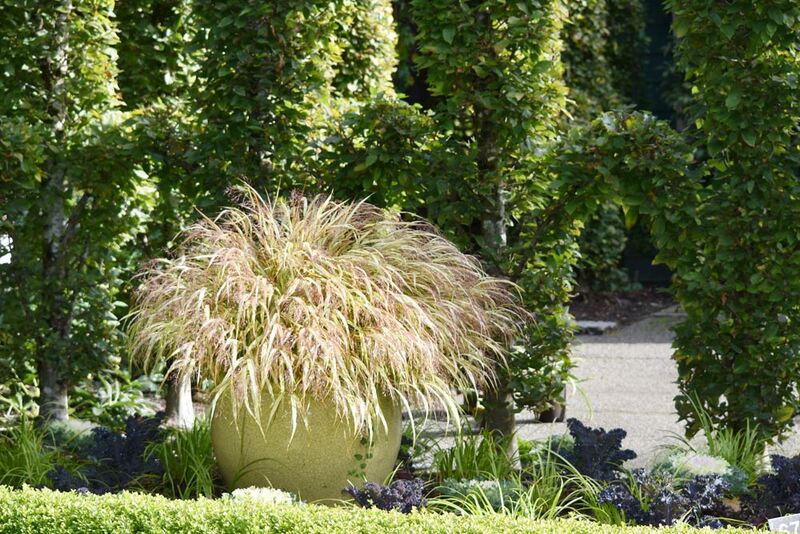 A fun way to experiment with color and form is to create container plantings that try out ideas. 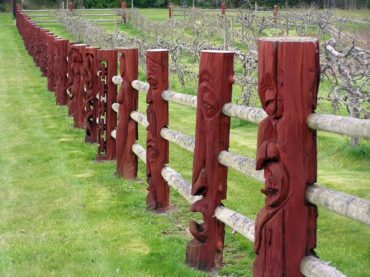 These can then be adapted to the garden, with your senses more aware and tuned into the details that might otherwise go unnoticed. Every passionate gardener will come home with unexpected plant purchases or gifts and wander around the garden, looking for a good home for the latest acquisition. Unexpected additions keep gardeners creative and nimble, but having a focused garden vision will help the garden evolve and improve with time. 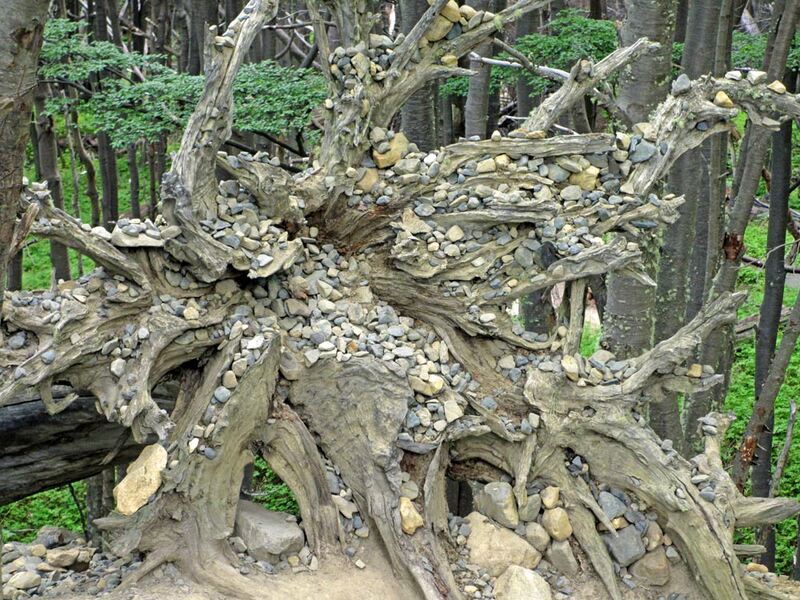 A natural sculpture in the middle of a forest can be easily replicated in a garden. Chile. 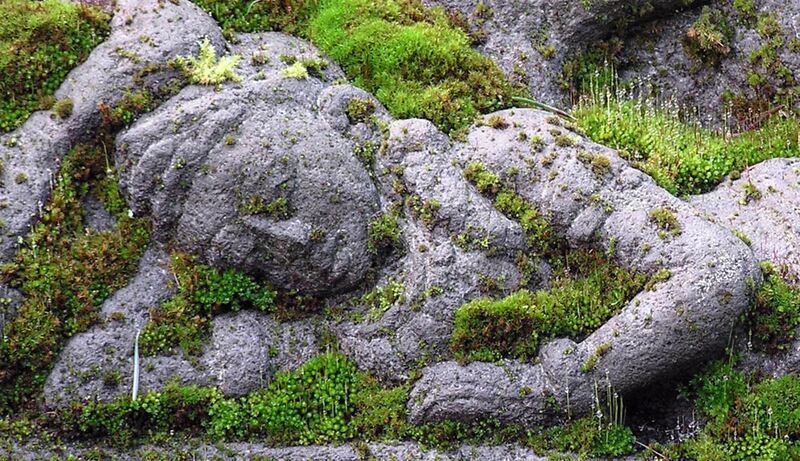 Is there anything more calming than a moss-covered sleeping goddess? Bainbridge in Bloom, 2007. 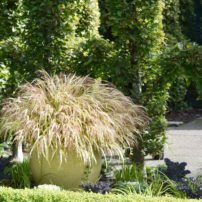 Backed by the famous hornbeam hedge at Heronswood, Kingston, this large planter truly shines as the focal point, filled only with Japanese forest grass.